As the debate over testing intensifies, it is important to remember how the concepts behind annual exams arose— and to understand why they still matter. As the debate over testing intensifies, it is important to remember how the concepts behind annual exams arose — and to understand why they still matter. For the first half of the last century, Americans lived with a deep inequity built into their education system. Communities were allowed to educate minority students in schools that were separate from and unequal to the campuses in which white students enrolled. In 1954, the Supreme Court famously struck down that political and economic perversion in its landmark Brown v. Board of Education decision. In theory at least, the color of a student's skin would no longer determine the school they attended. Within a decade, the search for justice gave birth to another big idea: Not only would racial walls come down on campuses, no longer would it be right to have major gaps between the academic achievement of white and minority students. This muscular notion led to the Elementary and Secondary School Act of 1965, which later became known as the Elementary and Secondary Education Act. The law embodied the belief that schools in disadvantaged communities would receive the resources to provide their students a decent education. At the same time, the nation needed to know whether poor and minority students were achieving in their classes. America’s progress depended upon their progress as well as that of white and higher income students. Arising from this big idea came another revolutionary concept. School districts and campuses would be held responsible by policymakers and taxpayers if they did not provide a decent education for every student. This idea came to be known as school accountability, and it was built around three principles: Creating rigorous academic standards, measuring student progress against those standards, and attaching some consequence to the results. Those core values remain a central, yet contested element in American education. Fierce discussions roil across states about who should hold schools accountable, how they should hold them accountable, and what should happen if schools do not show progress for all their students. The debate is intensifying with many states easing up on their expectations for students, educators, and parents questioning annual, independent exams. As that debate continues, it is important to remember our past and why the concepts behind school accountability arose. It also is essential to understand why they still matter. The history of school accountability first tells us that the idea and its principles have strong parentage. They have drawn the support of Democrats and Republicans, leaders of business and the civil rights community, and parents and educators. Look back to 1965 and Lyndon Johnson’s passage of his historic education law. The legislation moved through the U.S. House of Representatives with 263 votes. A strong majority of 73 senators similarly passed the law in their chamber. “I think it is very difficult for a person who lives in a community to know whether, in fact, his educational system is what it should be, whether if you compare his community to a neighboring community they are doing everything they should be, whether the people that are operating the educational system in a state or local community are as good as they should be. 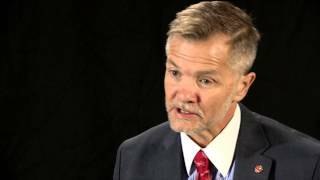 Mike Miles, Superintendent of the Dallas Independent School District, discusses how accountability can help educators in their mission of improving students' proficiency. During this same period, policymakers started developing the National Assessment of Educational Progress (NAEP). Advocates in the War on Poverty wanted to know whether all students were moving ahead. By the end of the 1960s, the standardized test was given voluntarily in schools. Ever since that period, school accountability has continued to evolve. In the 1970s, as desegregation took hold, students started improving on the NAEP exam, which became known as the “Nation’s Report Card.” The nation also began to implement the idea of equity in terms of resources and facilities for disadvantaged students and their schools. In Dallas, for example, the school district finally began to assess students who previously had not been tested. Before the early 1970s, the Dallas school district was not required to give the Iowa Test of Basic Skills exam to minority students. In the 1980s, the Reagan administration's "A Nation at Risk" report prompted states to get more serious about elevating their expectations for students. The report shocked many Americans as it detailed how U.S. schools were falling behind campuses around the world. 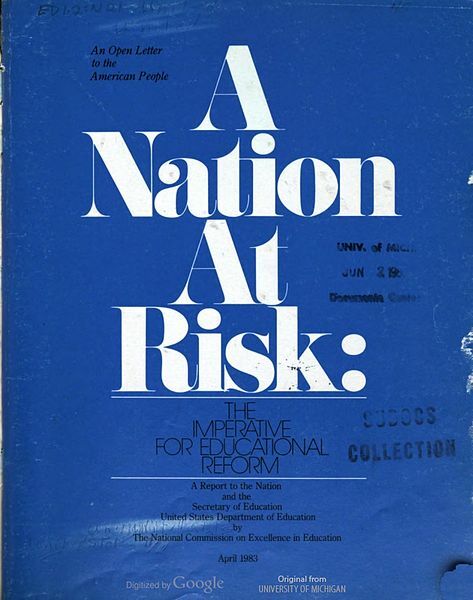 In depth: "A Nation at Risk: The Imperative for Educational Reform", April 1983. In Reagan’s last term, Education Secretary William J. Bennett took these beliefs even further. If more dollars were going to flow into schools to improve their work, there had to be some way of measuring for results. The secretary even kept a map on his wall showing various levels of progress across the states. During the 1980s in Texas, Ross Perot championed "No Pass, No Play" as a way to alert schools and students alike that star athletes would not shine under Friday night lights if they did not achieve in the classroom. “No Pass, No Play” attracted national attention as the standards-and-accountability effort took further shape. 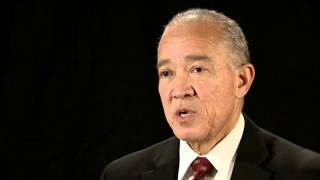 Texas' Republican Governor Bill Clements also set Texas up to become a leader in the school accountability movement. He pressed state legislators to fund a commission to examine whether the state's schools were preparing students for an economy that was turning exceedingly technological. This commission provided the framework for the accountability standards that the state would later adopt. In the 1990s, the standards-and-accountability movement picked up even greater momentum. After a 1989 summit involving President George H.W. Bush and the nation’s governors, including then-Governor Bill Clinton, leaders from both parties started pushing for more rigorous assessments of student performance. They supported regular means of examining students to see if they were meeting higher expectations. The proof of this bipartisan backing was evident when Democratic and Republican governors started building upon each others' committment. That was particularly true in states such as Massachusetts, North Carolina and Texas when they passed school accountability laws. The RAND Corporation published a paper in 2000 citing both Texas and North Carolina as the two states that got it right and made the greatest gains in student achievement in the decade. In Texas’ case, GOP Governor George W. Bush of Texas and Democratic Lt. Governor Bob Bullock backed requiring an annual state examination of students. They also supported a clear breakdown of the results. By breaking apart the data, parents and educators could see how well schools were serving students from all backgrounds. Intentionally or not, schools previously could hide low-performing students behind the forward march of their high-performers. Being able to see school performance data in terms of race, income, disability, and gender tore down that wall. Indeed, gains were made for all students. Data source: U.S. Department of Education, Institute of Education Sciences, National Center for Education Statistics, National Assessment of Educational Progress (NAEP). Accommodations were not provided in 1990, 1992, and 1996. The basic level on the NAEP is defined as partial mastery of the knowledge and skills at each grade; proficient is defined as solid academic performance for each grade assessed; and advanced is defined as superior performance. Data source: U.S. Department of Education, Institute of Education Sciences, National Center for Education Statistics, National Assessment of Educational Progress (NAEP). Black includes African American. Accommodations were not provided in 1990, 1992, and 1996. The basic level on the NAEP is defined as partial mastery of the knowledge and skills at each grade; proficient is defined as solid academic performance for each grade assessed; and advanced is defined as superior performance. Data source: U.S. Department of Education, Institute of Education Sciences, National Center for Education Statistics, National Assessment of Educational Progress (NAEP). Hispanic includes Latino. Accommodations were not provided in 1990, 1992, and 1996. The basic level on the NAEP is defined as partial mastery of the knowledge and skills at each grade; proficient is defined as solid academic performance for each grade assessed; and advanced is defined as superior performance. In the 2000s, another bipartisan coalition came together to build upon the foundation of the previous four decades. After becoming president, George W. Bush partnered with Republican Rep. John Boehner of Ohio, Democratic Rep. George Miller of California, Democratic Sen. Edward Kennedy of Massachusetts, and Republican Sen. Judd Gregg of New Hampshire to pass the No Child Left Behind Act (NCLB). 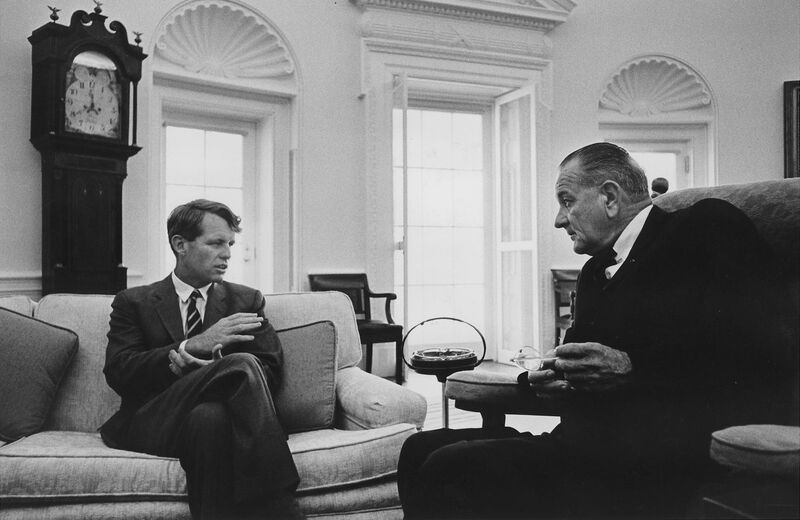 During negotiations over that legislation, which was an update of President Johnson’s earlier law, Kennedy picked up on the passion of his brother Bobby for making sure all students were moving ahead. Their common belief in that fundamental idea led the Massachusetts Democrat to champion NCLB. 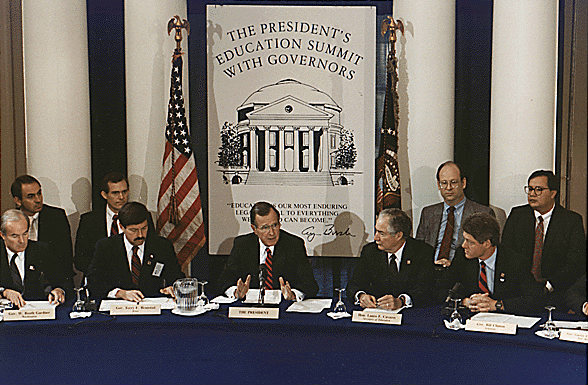 President Bush used the phrase “soft bigotry of low expectations” as a way to explain the need for this legislation, which required all states to see whether their students were meeting the standards of their states. Importantly, the law ensured the results are transparent so parents, schools and taxpayers can see how well each group of students performs in a district and on a campus. Prior to that requirement, annual exams were not given in most states. When state tests were required, they usually were offered once in elementary school, once in middle school and once in high school. Nor was the data usually reported in an easy-to-understand way so parents, taxpayers and educators could see how schools performed according to the race, income, disability, and gender of their students. And, disturbingly, there were few consequences for any of the results. In our current decade, accountability has come to include using data from test scores to give a fuller and more contextual evaluation of classroom teachers. A number of states and school districts are including some form of classroom data in their reviews of instructors. In states like Tennessee and cities like Dallas and Houston, use of student data is becoming part of the way to evaluate the job performance of teachers. The strong flow of information also is being used to measure how much students grow in a subject each year. Annual data allows schools to measure student growth in a more accurate way and give credit to a teacher's hard work in catching a student up. For a time, student progress flowed from these efforts. Student scores on key indicators showed a movement forward, even if there was still plenty of room for improvement. The advancement was especially true for poor and minority students, the very ones the accountability movement was given birth to benefit. Nationally, the data shows that test scores in key subjects like math and reading rose. Sometimes, they rose dramatically, especially as the era of accountability with consequences took root. Data source: U.S. Department of Education, Institute of Education Sciences, National Center for Education Statistics, National Assessment of Educational Progress (NAEP). Long-Term Trend Mathematics Assessments, scale from 0 to 500. Data source: U.S. Department of Education, Institute of Education Sciences, National Center for Education Statistics, National Assessment of Educational Progress (NAEP). Long-Term Trend Reading Assessments, scale from 0 to 500. Math scores of nine-year old Hispanic students on the NAEP exams improved from 1999 to 2008 by the equivalent of almost two grades. Likewise, NAEP math scores for nine-year old African-American students increased over that time by about one-and-a-half grades. Scores in the make-or-break subject of reading shot up, too. From 1999 to 2008, black and Hispanic nine-year olds grew by two grade levels in reading, according to NAEP results. Similarly, the achievement gap between white and minority students started to close. The gap narrowed most noticeably during the period when the nation vigorously focused on results. In the 1990s, when the idea of serious consequences for school performance was only starting to develop in states, the achievement gaps between whites and students of color actually grew in some key areas. But in the era of strengthened accountability, the gaps narrowed for nine- and thirteen-year old African-American and Hispanic students between 1999 and 2008 in such critical areas as math. At the same time, scores for white students in 2008 were the highest ever in both reading and math for nine- and thirteen-year olds. What was good for poor and minority students was good for all students. Similarly, a 2013 study in the American Economic Journal reveals that states, districts, and schools have responded to data from tests. A review of Florida’s accountability system showed that educators focused on subjects being tested and ensuring that curricula and instruction align with what is being tested. Some people will look at reports like these and think there is an undue emphasis on testing. Or they may think that education is being distorted just to improve test scores. What they really show is that effectively teaching to the standards set by state leaders can lead to student success. Yet here we are, nearly five decades after the birth of this big idea, and school accountability is losing momentum. How could that be? How could reforms that helped improve student performance, especially among minority students, start to lose favor? Several reasons explain the waning support. For starters, these classroom gains were hard-gotten. They took a toll on people, including among supporters of accountability. Change-agents often grow weary of pushing a boulder up a hill. No matter how compelling their cause, the process wears them down. That was true in this debate, where some wanted change faster than it came. They lost interest and moved on. Educators called upon to implement higher standards also started pulling back. The higher the bar went up to show success, the greater the challenge they faced. Resistance built up among superintendents, principals and teachers. Some districts also overdid testing. They administered too many of their own benchmark tests before their state's annual exam. Currently, states are only required to administer one annual test in reading and math in grades three through eight and once in high school. A Center for American Progress study found that districts administer more tests than states. In one district in Kentucky, students were tested 20 times a year. The state only required four of them. Accountability's concepts have not always been implemented well, either. There is no other way around it: mistakes were made. One example is the school rating systems that states have developed using data from their annual tests. Those rankings often are too confusing or unfathomable for parents and educators to understand. Even worse, the data was often provided too late to use in making decisions about where to send their children to school. Part of the backlash also has been orchestrated and well-financed. Teacher unions have strongly supported the opposition. They have poured money into efforts to resist independent, objective tests. So have parent groups in some states. Never mind that those exams provide data for schools and parents to see how well campuses are performing compared to others within a town or state. Never mind that such tests show how well an educator is helping his or her students improve. Never mind that the results may show where an instructor needs professional help. David Chard, Dean of the Simmons School of Education and Human Development at SMU and Chris Garcia, Teaching Trust and Former Principal, Uplift Peak Preparatory discuss school accountability. Union leaders continue to make full-throated complaints against standardized testing. “The fixation on testing and data over everything else is a fundamental flaw in how our nation approaches public education,” wrote Randi Weingarten, president of the American Federation of Teachers, in a Huffington Post blog entry. The concepts also have been watered down as states have received waivers from the No Child Left Behind Act. In some cases, states were given exemptions from the law's key requirement to show adequate yearly progress. Similarly, the revolt over the Common Core’s standards and assessments has contributed to the pushback against school accountability. In states like California and New York, parents and educators are rising up against the testing that goes along with those standards. Beyond Common Core, some states have decided on their own to weaken some of their academic standards and annual exams. Texas legislators decided in their 2013 session to allow some students to skip annual tests in grades three-thru-eight. The Obama administration wisely overruled that idea as it considered giving Texas a waiver from NCLB. The scene was a striking contrast to 20 years before. In 1993, a bipartisan majority of Texas legislators approved a new school accountability system. So, the resistance is there. No one can question that. But, if this were the subject of heart disease, would we simply end the conversation? Or suggest that we quit testing the patient? Of course not. We would continue to search for the right answers – for the patient’s sake. The same is true with school accountability, the ultimate aim of which is to improve student achievement. Student advancement has been the goal through Republican and Democratic administrations. There certainly are ways to keep improving upon these concepts, but education reform is never complete. We can’t let the search for answers slow us down – for the students’ sake. Students increasingly need the means to become mobile after they leave high school, whether that means going to college or finding a good-paying job with an equally good future. They will enter a world that is more competitive, not less. In fact, more than at any point in American history, economic and social mobility depends upon having higher-order skills. The ability to innovate and solve problems is increasingly valued in a service-oriented, technology-driven economy. By contrast, low-skill jobs are not projected to grow substantially, as the Charles A. Dana Center at the University of Texas at Austin reports. Even middle-skill jobs are in less demand. Those jobs declined in the 1980s, 1990s and 2000s, according to a study by economist Anton Cheremukhin of the Dallas Federal Reserve Bank. Jobs that required critical thinking increased in each of those decades. Would You Want Your Doctor to Quit Testing You? Parents certainly understand the need to make sure their children are moving toward good opportunities. Polling data shows parents prefer actual achievement over gradual progress. According to a survey by pollster David Winston, 58 percent of parents said they did not consider it a success if a student entered school a year behind and caught up half a grade over the course of that same year. Minority parents especially did not consider simply showing progress a successful outcome. Sixty-one percent of African-American parents said catching up half a grade was not success. Sixty-five percent of Hispanic parents responded similarly. Indeed, 60 years after Brown v. Board of Education and 50 years after the Elementary and Secondary School Act, the role of minority students remains critical to the future of the United States. Perhaps even more so. The latest Census Bureau data for Hispanic students alone show they make up about a quarter of the nation’s public school enrollment. That figure was up from 17 percent in 2000 and is projected to grow significantly, especially in large, diverse states like Texas and California. We already see what a retreat from accountability can mean. Nationally, scores on leading indicators like the NAEP exams show stagnation over the last half-decade. The rapid gains in math and reading have tapered off for nine-year olds. In Texas, data from the Texas Higher Education Coordinating Board shows that college completion rates for Latinos and African-Americans are starting to flatten out after several years of progress. That progress had been built upon the foundation of a strong K-12 system. Now that Texas has started to change that system, state policymakers should pay attention to the warning signs. For these reasons, students cannot afford for policymakers, parents and educators to retreat from school accountability. Instead, this is the time to get more young Americans ready for post-secondary success, ready for the better jobs and ready to complete the extra education they will need to get to those better jobs. Put another way, now is the time to continue the climb to the summit of the mountain. To be sure, there are ways to improve state accountability systems, as well as the No Child Left Behind law. As a nation, we need to have a conversation about how to mend, not end school accountability. That conversation should involve parents, educators and policymakers. Schools need annual, statewide independent testing in reading and math. They don’t need a heavy volume of tests. Overloading students with too many district benchmark exams is not productive. That is especially true when those tests are poorly aligned with a state’s standards. Parents should be getting better information on the different types of testing, who requires the test, and the purpose of the test. Schools need carrots to improve, not just sticks. For example, find ways to reward schools that show significant improvement in getting students ready for college or a career. As a nation, we must preserve and build upon the principles that have led to gains in student achievement. If we do not know the difference between mending accountability as opposed to ending it, we will return to the world of leaving children behind. This is something we cannot do. We cannot do it for the sake of our economy. We cannot do it for the sake of our children. And we cannot do it and remain true to the values of equality and justice that have marked our path since Brown v. Board of Education set out to eliminate the deep inequities within our education system. The George W. Bush Presidential Center, rooted in the guiding principles of President George W. Bush and Mrs. Laura Bush, engages communities in the United States and around the world by cultivating leaders and advancing policies to solve today’s most pressing challenges. The George W. Bush Institute is an action-oriented, nonpartisan policy organization with the mission of engaging communities in the United States and around the world by cultivating leaders and advancing policies to solve today’s most pressing challenges. The Bush Institute’s Education Reform effort works to increase student achievement through programs focused on accountability, school leadership, and middle school transformation. The Education Reform initiative advocates holding schools accountable for teaching all students, which includes collecting transparent, comparable, and reliable data to inform school improvement. By William McKenzie and Sandy Kress. Designed and developed by Andrew Kaufmann. Video production by Scott Robertson. Charts built using Highcharts JS charting engine. President Lyndon Baines Johnson delivers remarks at the signing of the Elementary and Secondary Education Act, April 11, 1965 in Johnson City, Texas. 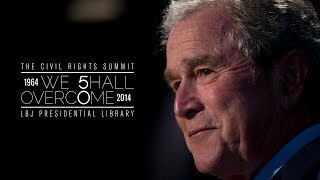 President George W. Bush at the Civil Rights Summit at the LBJ Presidential Library, April 10, 2014.